Can you dance like no one’s watching? Would you like to be in a video? 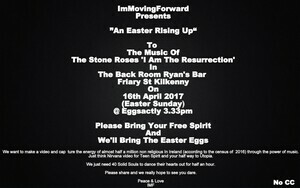 Johnny Keenan, him off Broadsheet on the Telly, and pals are assembling 40 souls to go radio rental to the sounds of The Stone Roses’ ‘I Am The Resurrection‘ tomorrow afternoon. A joyous celebration of non-belief, the plan is to recreate something not dissimilar to the crowd reaction shots at the climax of in Nirvana’s Smells Like Teen Spirit video. In a back bar in Kilkenny. You will be needed for 30 minutes, Johnny promises participants with egg-shaped surprises a distinct possibility. The Back Room, Ryan’s Bar, Friary Street, County Kilkeny at 3.30pm. Posted in Misc and tagged Johnny Keenan at 2:10 pm on April 15, 2017 by Admin. You won’t belieber what happens next.. Thanks for the plug lads. To say we’re eggcited is an understatement. Johnny, will it be filmed and posted on here or youtube? It will Zena. All we need is a crowd though. Here’s hoping. Has all the makings of a beautiful gathering. Sorry, it does say above that it’ll be videoed. Great stuff, would go but will be at a 1916 commemoration in Dublin. Johnny, what sort of people will be at this? Really? Or is that the chocolate talking. For a moment I thought that was funny, but then I noticed it didn’t have a ‘?’ at the end so I thought the author was an idiot. I’m calling RACISM. It’ll be an almighty resurrection if they delete ‘res’. I think Ben is going to be there, Ben Redmond, that is. When will the video be posted, Johnny? yOU KNOw…hang on a minute. You know something Johnny A to the K.to the I.N.G. …if I was a girl…no messing, I would, and I’d take photographs too. Johnny’s a reasonable type of guy, he may be open to offers, sure put a wig on and chance your arm…. here ya go folks. make of it what ya like. thanks for the interest and I hope it interests you. Ok here is the straight video without the ‘arty’ 333 stills. Well done Johnny & friends, lovely uplifting tribute to Dara. R.I.P.